I hate morning sickness. Every pregnant woman goes through it. If you have never had it while pregnant, please consider yourself a lucky duck! I am due in August and early pregnancy seems to be the worst experience in the mornings. I get so nauseated. When I wake up and go to lift my head, it seems to be a nightmare. I was honored and very lucky to work with an awesome company, Three Lollies on reviewing a great product for morning sickness! You can read more about them on their website too! Three Lollies has several products for morning sickness. I received Preggie Pop Drops Plus from them. I honestly have to say that I love them. They are natural, drug free, They contain 21 Lozenges in Sour Fruit Flavors and contains 10mg of Vitamin B6! The best thing is that they are doctor recommended! I do prefer the Sour Raspberry to the Lemon though. They also make Preggie Pops, basically the same thing but different flavors and its on a stick. 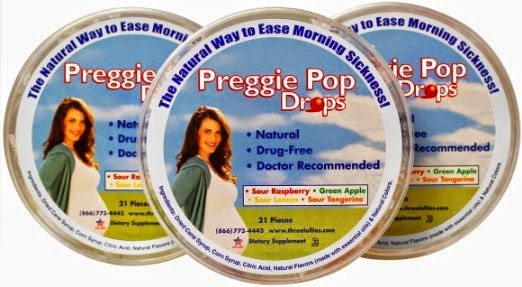 You can use the preggie pop drops for nausea and morning sickness. I have seen people talk about using Three Lolly products for chemotherapy as well. Overall, I have to say that I am completely satisfied with the products that I received! I highly recommend them to all of you that are pregnant or need a simply cure to your nausea! I wish I had known about them with my other pregnancies. Who would have thought 4 kids later and I would just now be trying them on baby #5? They really do taste delicious. They are sour but its the good kind of sour, not the kind that makes your lips pucker! Check out the FAQ section on the website for more info about their products! Buy It: You can purchase Preggie Pop Drops Plus for $5.50 on the Three Lollies Website. Check out the other products that they have to offer as well, You will not regret it. Please follow Three Lollies on Facebook and on Twitter to stay up with the latest news about them! Don't leave just yet! We have a giveaway going on too!! Win It: THREE Winners will win a tub of Preggie Pops Drops Plus!! That's right! How generous of Three Lollies to offer this for you all! This giveaway will end on 01/11/2013 11:59 pm! This will give us time to get plenty of entries in. This will be a popular giveaway for you all! US ONLY, Winner(s) will have 24 hours to respond to the winning email. Please enter with the Giveaway Tools Below. ... Disclaimer: The Small Things is not responsible for prize shipment. Three Lollies will be shipping prizes to my winners. The Small Things was not paid to review the product above, I was given the product and in return I am giving my honest review. Actually my sister-in-law is expecting right now, and she gets TERRIBLE morning sickness, and unfortunately for her, it hits at unpredictable intervals! Yes, a good friend of mine has morning sickness. Yes...I have it myself as I type this...no fun!! My sister-in-law could use this. I had used them for my pregnancy and they are great. IF nothing else, they take your mind off of it. These look amazing! Im luckily past the first trimester so my nausea is not nearly as bad. I was one of the lucky ones, although I also missed out on all the fun of the cravings and the whole waddle thing.